WPS Parking Systems has used its years of experience in providing parking solutions to develop WPS-BC Easy: a fully automated, compact parking system. WPS-BC Easy uses state-of-the-art barcode technology and operates on the Windows platform. There are many advantages to using barcode technology, including low maintenance costs and exchangeable components. The goal of WPS when developing WPS-BC Easy was to provide an efficient system which is easy to install, operate and service resulting in lower operating costs. WPS-BC Easy offers maximum levels of convenience and optimum functionality in relation to its price. WPS-BC Easy is ideally suited for hotels, supermarkets, offices, park & ride locations and smaller parking operations. High quality components and materials are used in all WPS-BC Easy stations which basically include entry and exit terminals, barrier gates, automated pay stations, cashier terminals and central data registration systems. WPS-BC Easy software is divided into modules allowing the creation of a software package that is individually suited to needs of a specific parking operation. WPS-BC Easy provides secure parking for customers and prevents the misuse of valuable parking spaces. Numerous types of parking users can be created in the WPS-BC Easy software by setting up groups, time zones and tariffs along with using the several available discounting methods. Card access subscribers can have flexible access rules depending on the assigned group and/or time zone (ideal for offices); cards with limited validity can easily be programmed (for hotel guests or recreation parks); daily parkers can be given a discount (great for supermarkets or office visitors); delivery vehicles or taxis can access the system without delay and can be tracked (for hotels or supermarkets); and weekend parking tariffs or reduced tariffs can be easily programmed. The BC Easy Entry Terminal is a multi-functional parking access and revenue control terminal for barrier gate controlled offstreet parking facilities. WPS patented thermal bar code ticket technology provides a ‘contactless’ ticket processing environment that ensures a high level of reliability and powerful functionality. Entry options include; credit, debit and chip card; RFID cards and transponders; bar code passes. The BC Easy Express Exit Terminal is a multi-functional parking access and payment processing station installed at barrier gate controlled off-street parking facilities. WPS patented thermal bar code ticket technology provides a ‘contactless’ ticket processing environment that ensures a high level of reliability and powerful functionality. Express exit options include; RFID tags; barcode passes; and pay by credit, coin and debit and chip card. BC Easy Pay-On-Foot Stations are located strategically throughout the parking facility and building complex to process parking payments for customers before they return to their vehicles. The customer-friendly terminal guides users in a step-by-step fashion. Payment types accepted include; Coins, bank notes, credit card, chip card, debit card and decrementing value card. Change is dispensed in coins and bank notes. 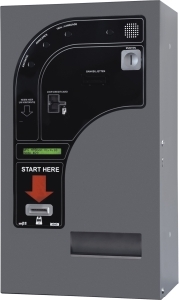 When used in conjunction with barrier-gate controlled BC Easy entrance and exit stations the BC Easy Pay-On-Foot Station achieves benefits for parking facility owners and operators, i.e. maximizes revenue control, reduces staffing costs-and also provides a convenient and seamless parking experience for customers. The manual pay station is the system device used to process manual payment methods. The desktop control panel contains 6 pushbuttons for several functions and a barcode insertion reader for processing subscriber barcode cards and daily barcode tickets. Optionally the barcode insertion reader can be replaced by a proximity version. 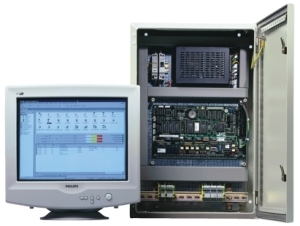 The central data registration system is the central control station through which the PC manages, controls and programs the wide range of functions available in the BC Easy parking control system.